Samsung delivers a solid smartphone for Sprint in the Conquer 4G. This mid-range WiMax handset offers 4G speeds to the mobile masses in a smaller, less expensive, yet still capable, package. Sprint's latest WiMax 4G smartphone is the sub-$100 Samsung Conquer 4G. If you want speedy data services, but don't necessarily want or need the huge footprint and top-end features of Sprint's other WiMax handsets, the Conquer 4G is a good alternative. Samsung today published details about the D600 Conquer 4G, a new WiMax Android smartphone for Sprint. Based on the specs, the Conquer 4G appears to be a mid-range smartphone. 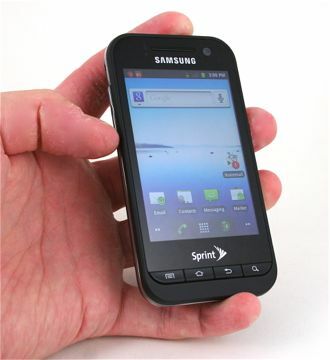 Sprint and Samsung today announced the Conquer 4G, a new Android 2.3 Gingerbread smartphone that works on Sprint's WiMax 4G network. It has a 3.5-inch HVGA (320 x 480) display, 1GHz processor, and offers a 3.2 megapixel main camera with flash, and 1.3 megapixel user-facing camera. Sprint today released new details of the 5G network it will launch this May and June. Chicago, Atlanta, Dallas, and Kansas City will launch in May, while New York City, Los Angeles, Washington DC, Phoenix, and Houston will launch in June. Sprint today announced the availability of a new Sprint iD pack that is aimed at making smartphones easier to use for seniors. The Active Senior ID pack includes 20 applications and services that Sprint believes can help to improve the smartphone experience for older users. Why get this phone when you could get the Nexus S 4G for the same price? The Nexus has superior specs, and guaranteed update support from Google. The only advantage is it has a memory card slot. Samsung's low-end phones are never worth the headache. You'll never get software updates and the phone will have weird bugs that never get resolved. personally used this phone? Yes past poor performances would suggest not to get this phone. Yet wouldn't those past failures lead to learning and improving for future products? I personally have the Samsung Moment and enjoy the phone. isn't needed here. If you haven't touched the phone than how do you know it's bad already?